Equine osteoarthritis is a debilitating, degenerative condition affecting horses of various age groups and with a multitude of causes, ranging from conformational flaws, trauma to infectious origins. Osteoarthritis is also one of the main causes of lameness in the equine athlete, resulting in lost time, performance and high expenditures on various therapeutics. Curcumin, the active constituent of turmeric, has been shown in human research trials to actively down regulate inflammatory mediators through two main mechanisms: NF-kB inhibition and through activities as a secondary antioxidant. Equine osteoarthritis is primarily mediated by various cytokine release from damaged cells within the joint, resulting in high levels of PGE-2 and MMP-9, which further result in cartilage degradation and pain. Through NF-kB inhibition, curcumin has been shown to down regulate many inflammatory mediators, including PGE-2 and MMP-9, along with COX-2 enzymes. Curcumin has not only been shown to be fairly effective in human trials, but has also been shown to be safe even at high dosages with no noted side effects. Traditional therapies aimed at relieving clinical signs associated with equine osteoarthritis include non-steroidal therapy, polysulfated glucosamines, intra-articular steroids and hyaluronic acid derivatives. Newer therapies include shock wave and IRAP therapy. The main goal of therapies include reduction of pain, reduction of localized inflammation and slowing of the degenerative process. This is a complicated task as there are many different cytokines and enzymes involved in this process. The primary mediators that we are interested in include PGE-2, MMP-9, IL-1, TNF-α, COX-2 and 5-LOX. Almost all of the inflammatory mediators linked to arthritis have been shown to be regulated by transcription factor nuclear factor-κB (NF-κB). 4 Given all of the evident factors involved, it is difficult for one type of therapy to actively target all entities. Current therapeutics for equine osteoarthritis range in expense for the owner and have a wide range of effects, some potentially being harmful. The effects, if seen, are generally short lived and thus, necessitate repetitive treatments, which can increase the possible negative side effects and overall cost to the owner. 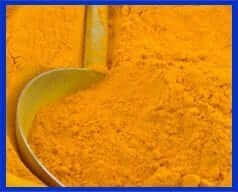 Curcumin, being a natural option, can potentially be more effective and cost effective for long term therapy. Two separate trials were conducted evaluating the effects of a proprietary formula consisting of curcumin, vitamin E and vitamin C on horses with varying degrees of clinical osteoarthritis. The formula was created by Tom Schell, D.V.M and formulated with the assistance of a human nutraceutical pharmacy. In the first trial, two horses were evaluated before and after therapy, which consisted of top dressing the curcumin formula on the feed once daily for 30 days. Lameness scores were assessed at the beginning and end of the trial. Bloodwork was assessed at the beginning and end of the trials, consisting of a routine blood chemistry profile as well as a complete blood count. Synovial fluid was also retrieved from the affected joint prior to therapy and at the end of the trial. The synovial fluid was then submitted to the MD Anderson Cancer Research Center for evaluation of eicosanoid levels. The average age of the horses in this trial was 15 years and all horses were geldings of varying breeds and disciplines. In the second trial, 6 total horses were evaluated with varying degrees of osteoarthritis. The horses were again assessed pre and post for lameness scores, as well as complete blood counts, general chemistry panels, lymphocyte phenotypes, C-reactive protein and RBC EFA levels. Synovial fluid was retrieved from an affected joint before and at the end of the trial. Synovial fluid was submitted to the Ohio State University for matrix-metalloproteinase 9 evaluation and to the MD Anderson Cancer Research Center for evaluation of eicosanoids. The average age of the horse in the second trial was 16 years and all horses were geldings of varying breeds and disciplines. Table 1.0: Trial One Patient Assessment. Table 1.1: Trial Two Patient Assessment. Effects of Curcumin Formula on Overall Lameness. Lameness scores in all horses improved by at least one grade, with the majority of horses being improved by 2 grades. Both horses in the initial clinical trial improved by one grade of lameness. One of the horses in the first trial had recurrent and persistent synovial effusion of the tarso-crural joint that had previously only responded intermittently to intra-articular steroids and HA. During this trial, the synovial effusion resolved by 70% as well as the associated stiffness in that particular limb. In the second trial, all horses improved by at least one grade of lameness. The second trial had a variety of lameness scores and severity of osteoarthritis, primarily localized to the tarsus. One horse in the second trial had diffuse carpal OA, collapsed suspensory apparatus in the rear limbs and moderate OA of the tarsal-crural joint. This particular horse was generally very stiff and categorized as a grade 4/5 lameness. Prior therapy on this particular horse included intermittent phenylbutazone administration by the owner. This particular horse improved by one grade of lameness as perceived by myself. He was generally perceived as moving more freely, but still overall stiff. Another horse in the trial had a prior history of intra-articular ringbone in the left forelimb which had been treated with localized intra-articular injections of methylprednisolone. This particular horse experienced a one grade improvement in lameness as well. The remaining horses in the study did very well by our perception with an average of a two grade improvement in the lameness. Some of the remaining horses were able to be removed from daily administration of other joint supplements and phenylbutazone administration. Overall, there was an 80% perceived response rate in the patients and owner satisfaction. The biggest notation by the owners was that the horses seemed to feel better overall and moved about much looser, with some of the horses exhibiting youth like activity. Effect of Curcumin Formula on C-reactive Protein. The horses in the second trial were evaluated for serum C-reactive protein levels, utilizing the laboratory at the Bio-Center located in Wichita, KS. We were unable to appreciate any change in the C-rap levels and all horses exhibited a level of less than 0.10 mg/L on the pre and post samples. Effects of Curcumin Formula on General Chemistry Values and Complete Blood Counts. Serum and whole blood was submitted non-fasting on all patients at the initiation and conclusion to the trial. There were no appreciable changes in the blood chemistry panels or the complete blood counts over the 30 day trial. Hepatic, renal values and protein levels were unchanged at the cessation of the trial. Effects of Curcumin Formula on Lymphocyte Phenotypes. Table 2.1: Lymphocyte phenotype analysis: pre and post 30 day treatment. Noted that horse 2 and 6 experienced sampling errors due to handling resulting in no post value determination. Table 2.3: Trial two synovial fluid eicosanoid levels. Table 2.4: Trial two synovial MMP-9 determination: pro-dimer and activated dimer, pro-monomer and activated monomer. Equine osteoarthritis is an inflammatory process secondary to various factors including increased stress on a particular joint from conformational flaws to repetitive trauma including stress from infectious processes. The underlying pathophysiology to condition is a release of inflammatory mediators, cytokines and reactive oxygen species from the synovium and chondrocytes, as well as neutrophils and other immune related cells. The cytokines and reactive oxygen species (ROS) then trigger further release of other inflammatory mediators from surrounding cells, which leads to further degradation, inflammation, pain and recruitment of immune cells. Tipical non-steroidal antiinflammatories, flunixen meglumine and phenylbutazone, result in a reduction in cyclooxygenase enzymes and are non-selective for the most part. This results in a reduction in COX-1 and COX-2 enzymes. This inhibition of COX-2 results in a reduction in the production of PGE-2 in the arachidonic acid cascade. The inhibition of COX-1 can impart potential degradation to the prostaglandin lining of the intestinal tract as well as influencing renal circulation. The potential side effects of a non-selective COX inhibitor are gastrointestinal ulceration and renal compromise. Steroidal anti-inflammatory medications, oral or intra-articular, impact the NF-κB transcription factor, resulting in varied levels of inhibition. This leads to decreased pro-inflammatory mediator release, decrease circulating COX 1-2 enzymes as well as potential immunocompromise due to decreased circulating interleukin levels. Side effects of long term or repetitive steroid usage are well known and include immunosuppression, gastrointestinal ulceration, hepatic compromise, renal compromise, water retention and potentially laminitis in horses. A new form of intra-articular therapy in the horse is IRAP or interleukin antagonistic protein. This form of therapy is targeted at reducing the circulating levels of interleukin-1 in the synovial fluid. This form of therapy is new and highly researched. Side effects are minimal at this time but do include risk of joint sepsis due to invading the joint for injection purposes. The equine osteoarthritis trials that we performed were small in nature and varied as to the degree of clinical osteoarthritis in each patient. The trial or study was intentionally created in this manner in order to initially gain an overview of the clinical improvement in a wide range of clinical settings. Overall, we did note an improvement in each patient with a high degree of owner satisfaction in the majority of patients. There were two candidates that did not exhibit marked improvement and both of those patients had marked changes on radiograph, in one case in multiple joints, characterized by moderate osteophyte formation and joint collapse. Despite the severity of their clinical conditions, all horses in the trial exhibited reduced levels of the activated monomer form of MMP-9 and PGE-2 within the synovial fluid. As mentioned earlier, all involved horses also exhibited a change for the better in their demeanor, with an improved attitude. Overall, the administration of curcumin orally to horses with osteoarthritis seemed to improve their overall function and attitude. It does appear that there is a more beneficial response in cases of lower grade osteoarthritis clinically than those higher grade patients with marked degeneration of the joint on radiograph. Despite a lowering of inflammatory cytokines within the synovial fluid, it is felt that there still exists a mechanical lameness attributed to the formation of osteophytes, eroded cartilage surface as well as soft tissue contracture associated with chronicity. In the short term of our trial, we appreciated some improvement clinically to the higher grade cases of osteoarthritis, but the changes clinically were minimal. It is possible that with a more prolonged study or administration of curcumin, that some of the mechanical issues attributed to higher grades of joint degeneration could improve. Curcumin appears to be a promising natural alternative to traditional NSAID’s, intra-articular injections, hyaluronic acid and PGAG administration. The results are encouraging after oral administration and there appears to be minimal to no side effects. The powdered preparation was deemed palatable by the majority of our patients and can be improved by the addition of flavoring enhancers. Future areas of further exploration would include inflammation associated with other soft tissue injuries, possible usage in cases of enteritis/colitis, septic shock, navicular syndrome and laminitis. Dr. Tom Schell and Timbercreek Veterinary Hospital, PC would like to thank the American Holistic Veterinary Medical Association for their support in the funding of this project. Kiuchi, F, Goto Y, Sugimoto N, Akao N, Kondo K, Tsuda Y. Nematocidal Activity of Turmeric: Synergistic Action of Curcuminoids. Chem Pharm Bull (Tokyo) 1993; 41:1640-3. Goel A, et al., Curcumin as “Curecumin”: From Kitchen to Clinic. Biochem Pharmacol 2007, doi:10.1016/j.bcp.2007.08.016. Khanna, D, et al., Natural Products as a Gold Mine for Arthritis Treatment, Current Opinion in Pharmacology 2007, 7:344-351. Thangapazham, RL, et al., Multiple Targets of Cancer Chemoprevention by Curcumin. AAPS Journal. 2006; 8(3): E443-E449. Cheng, AL. et al., Phase I clinical Trial of Curcumin, A Chemopreventative Agent in Patients with High-Risk or Pre-Malignant Lesions. Anticancer Res. 2001;21:2895-900. Lao, CD; Demierre, MF; Sondak, VK. Targeting Events in Melanoma Carcinogenesis for the Prevention of Melanoma. Expert Rev Anticancer Ther. 2006;6:1559-68. Mobasheri, A., abstract on equine chondrocytes. Personal communication; Ali Mobasheri, University of Knottinham, UK. 2008. Aggarwal et. al., Curcumin- Biological and Medicinal Properties. Turmeric: The Genus Curcuma. 2006: 297-368. Dodhar SD, Sethi R, Srimal RC. Preliminary Study on Antirheumatic Activity of Curcumin. Indian J Med Res. 1980;71:632-4. Liacini, A., Sylvester, J., Li, WQ., and Zafarullah, M. Inhibition of Interleukin-1 Stimulated MAP Kinases, Activating Protein-1 (AP-1) and Nuclear Factor Kappa B (NF-κB) Transcription Factors Down Regulates Matrix Metalloproteinase Gene Expression in Articular Chondrocytes. Matrix Biol. 2002; 21(3): 251-262.